"Jacobs handles a tough subject with grace and humor." 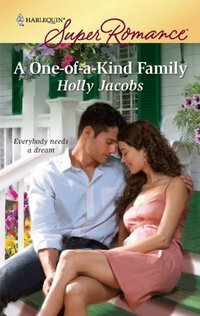 To be honest I can't remember whether or not I've personally read Holly Jacobs before I sat down to read A ONE-OF-A-KIND FAMILY, but I had heard wonderful things about her writing for years, and know that I've been stockpiling her books. What a truly lucky thing for me, because I've now discovered a new writer who I'm sure is destined to become a personal favorite. A ONE-OF-A-KIND FAMILY is the story of Anna Chapel who works with special needs people, and assists them in becoming the best person they can be. When she gets a call from Liam Franklin needing some assistance in finding someone to care for his twin brother Colm when he travels Anna gets more than she bargained for. As I read A ONE-OF-A-KIND FAMILY I found myself often smiling at the conversation between Colm and whomever he might be speaking to. It was easy to believe that a friendship was quickly blossoming between Anna and Colm, and I loved reading about it. As Colm changed and became more independent Anna and Liam found themselves butting heads, and from there developing a deep respect and understanding of one another. Therefore when love began it was again possible to believe. Ms. Jacobs took what could be a touchy subject and injected a perfect blend of humor into it, but didn't make Colm a spectacle for public humiliation. When I closed A ONE-OF-A-KIND FAMILY I wanted to search my shelves for other works by Ms. Jacobs. I think that says it all. "We got the house," Anna Chapel practically sang as she burst into The Sunrise Foundation's small reception area. The first thing that caught her eye was the big sign that boldly and proudly announced: Sunrise Foundation, Helping Exceptional People Lead Exceptional Lives. Today's news was certainly going to go a long way toward helping a small group of Whedon, Pennsylvania's exceptional people lead more independent, and certainly exceptional, lives. "It's ours," she sang out again. "We got it." Anna was so excited she couldn't contain the feeling any longer and wiggled her hips. There were some things in life that Anna felt she was blessed with, but there were others she knew she was not. Rhythm and her hair were two of the "were-not" areas. She wiggled her hips again and felt a few more of her Medusa curls escape her ponytail, but she was simply too happy to mind. "Was that a dance?" her friend Deanne Cellino, Ceelie as she was known, laughed. "Because if it was�" She shook her head and her long blond hair swished back and forth along her shoulders�shoulders that were so much higher than Anna's five-foot-five-inch frame. Anna always thought of Ceelie as a bit Amazonian�she looked like a warrior, but had the heart of an earth mother. She always got warm and fuzzy over the small things. "Hey, that was a Snoopy Dance of Joy, my friend. And you're not going to dim my absolute glee by pointing out that I have no sense of rhythm. If there was such a thing as an anti-rhythm, I realize that's what I'd have. But when one is dancing a Snoopy Dance, all you need is joy and I've got that. Come on." She grabbed Ceelie's hands and Snoopy-danced again. Ceelie was laughing so hard that all she did was stand there, but she finally got herself under control and did a bit of a jig as well. "You are absolutely crazy, girl," Ceelie assured Anna with a friend's affection. "I might be, but you're talking to a crazy person who got the house. It's so perfect, Ceelie. Three bedrooms, two full baths. A ranch, so with the addition of a ramp, it's handicap-accessible and it's�"
"Perfect," Ceelie filled in for her. Anna sighed, still riding the glow of her success. "Yes, perfect for our clients. It will make a great group home." All her joyful dancing had drained off enough of her excess energy that Anna could sit down. She plopped onto the small loveseat in the reception area. "Now, the work begins. We need to get our variance from the zoning board, then start the renovations and�" Her sentence faded as she started mulling over the long list of jobs that lay ahead of her. "Listen, enjoy the moment. Don't worry too much about what's coming up and what's behind you. Live in the now." "Deanne Cellino, ladies and gentlemen," Anna said to a nonexistent audience, "mystic, sage, warrior princess and all-around advisor to the world." Ceelie blew a raspberry in her direction. "You know I'm right." "Yes, I do." Anna studied her friend. Ceelie liked to say she was vertically challenged, but her abundance of height was needed to contain her giant spirit. Ceelie was one of those people who always seemed to have things together. She balanced a demanding job and parenting two children with apparent ease. Anna and Ceelie made up the entire staff of The Sunrise Foundation. Anna and Ceelie served as life coaches. Ceelie had come up with the job title and Anna always thought it was an apt description for a job that varied based on each client's highly individual medical and emotional needs. Ceelie's smile faded a bit. "And not that I'm anxious to bring down your happy mood, but your mother called." "Oh." Anna forced a smile she didn't feel. Her mother calling during a work day never boded well. "Did she say what she wants?" "She wants you to call her back as soon as possible. She said she tried your cell, but it went to voice mail." "I turned it off at my meeting with the real-estate agent, haven't turned it back on yet." She reached in her bag, pulled out the phone and switched it on, then scrolled through the missed calls�four from her mother. No, this did not bode well. "You should probably give her a call. You have an appointment in half an hour with that new case." Ceelie somehow honed in on the correct file that was midway through a huge stack and handed it to her. "A thirty-year-old who's been in his brother's custody for two years since their parents died in a car accident." Anna looked at the file labeled Colm Franklin. She opened it and found that other than an initial fact sheet, it was empty. Normally clients came to Sunrise with all kinds of documentation from other programs. "No notes?" "None. He was in special-ed classes back in high school. Long before Whedon practiced mainstream-ing. Once he finished school, he stayed home with his mother." "Oh. Do we have anything from the school?" "It's so long ago at this point that it's not really worth much�that would be my thought. Though you can call and see what the school has." "Even if I find something, I'm basically starting from scratch, right?" She shut the folder. "Yes, that's about the gist of it." "Any insights on the brother?" Family members called Sunrise for a variety of reasons. It helped to know what they wanted from the program. The Sunrise Foundation was a small non-profit organization that survived on a shoe-string budget with grants from both government and charitable foundations. The money for the new group home came from a huge grant last year. Ceelie had become a grant-writing pro, but there was never quite enough money to accomplish everything they'd like to do. And at Sunrise, everything was pretty much anything. From helping clients find housing, to teaching them to handle money, to helping some learn basic life-skills. Anna had taught clients to cook, to use a cell phone and even to tie their shoes. They'd helped place clients in jobs, and� Basically they facilitated whatever a particular client needed to improve their quality of life. Anna's job description changed on a daily basis for each of her fifteen clients. And the amount of time she worked with each client changed as well. Some needed more intense interaction, some just minimal support. "Liam Franklin, the brother, is self-employed. Something to do with computers and security." Ceelie shrugged. "You know me and technology." Anna did know. Ceelie could manage a word processor or spreadsheet on the computer, but other than that, she did nothing more complex than e-mail. "Liam works out of his home office most of the time, but he has to travel for business and is looking for a babysitter for Colm when he does. He got a referral from his doctor, and assured me in no uncertain terms that he wanted nothing more than that. Just a babysitter." Anna ran her fingers through her wildly springy hair. For years she'd tried products, haircuts, flat irons�. Finally, she'd reached the ripe old age of twenty-eight and admitted that she didn't have the time. She was going to embrace her outer Medusa and let her hair live the life it was destined to lead. After all, that was her job too: helping people lead the best lives they were capable of. She looked at the Sunrise motto again. Helping Exceptional People Lead Exceptional Lives. It was such a simple concept, and so succinct. Too bad some families never understood it. She wondered what kind of person Colm's brother�who simply wanted a babysitter�was. Maybe this new client was so severely limited that he needed that kind of care, but maybe he could do more� That sense of the possible, the idea of helping someone discover they could accomplish more than they ever imagined�that's what kept Anna doing what she did. "Just a babysitter," she murmured, more to herself than to Ceelie. "You can handle it," Ceelie, a Pollyanna in disguise, said. Anna nodded. "Sure. I'll do what's best for�" She glanced at the file. "Colm. Colm Franklin. After I call my mother back." "Colm doesn't know how lucky he is," Ceelie assured her. Anna hoped lucky was the word Colm and his brother would someday use to describe their first meeting at Sunrise. She got up and headed for her private office to call her mother. Although, she was already sure that there was some new crisis�one that probably involved a man in one way or another. She couldn't remember who her mother's current boyfriend was. The names changed so frequently, it was hard to keep up. Anna turned around and looked at her friend, who did another little Snoopy Dance. "You got the house." Anna's spirit immediately lifted. "You're right, we got the house." Liam Franklin pulled up in front of the small brick office front on Main Street. Whedon, Pennsylvania, was a small town south of Erie. There wasn't much to it, so he knew he must have driven by this building every day for years, yet he'd never noticed the sign in the window that proclaimed The Sunrise Foundation, with a rainbow and sun framing the words. He checked the business card again. Colm had lived with Liam since their parents died. Because Liam ran his computer security firm from home, things had gone well until work demanded he travel more. Taking Colm with him wasn't an option, and his day-help, Aunt Betty, didn't like staying overnight. So, Liam had contacted Colm's physician, thinking he might know of a babysitter who'd had experience working with people with special needs. The doctor had referred him to The Sunrise Foundation, and he'd talked to some woman named Ceelie there who had set up this appointment with this life coach, Anna Chapel. This Anna Chapel had been assigned his brother's case. He didn't like that Colm was in the system. Well, not really in the system. Sunrise was a private foundation that came very highly recommended. The fact that it was a community-based organization meant it was able to provide resources that each individual needed. Well, Colm didn't need anything except someone to stay with him when Liam was out of town, an occurrence that was happening more frequently. Balancing his job and his brother's needs made him really feel for working single parents. It seemed there was never a minute that he wasn't doing something� and often he was five steps behind. Liam walked into the office and a bell above the front door rang merrily. He stood in the reception area. There was a loveseat and a desk with a phone and computer. But the walls�the walls were amazing. They were decorated with framed pictures ranging from childish scrawls to a few more practiced ones. He was studying a particularly pretty sunrise�or maybe sunset�over a large body of water, when someone cleared their throat behind him. Liam turned and found a woman with the biggest hair he'd ever seen standing in a doorway, smiling at him. Her hair wasn't really styled big on purpose�you didn't need to be a hairdresser to see that. Rather it was big in a too-many-curls-for-one-small-head-to-have sort of way. "Well, hello," the woman said. "Welcome to Sunrise. How can I help you?" The words tumbled over one another in a single breath. She exuded a boundless energy that she seemed to try hard to contain. "I have a meeting with Anna Chapel." "Oh, you must be Liam Franklin." She hurried to him, thrust a hand out and continued, "It's so nice to meet you. Let's go to my office and see what we can do for you and your brother, Colm." He shook her hand, then followed her through the reception area, trying not to notice how her myriad of curls bounced about her head as she walked. If he were back in second grade, the urge to pull one and watch it spring back in place would have been too much to resist. But he was thirty and here on adult business. Anna led him to a neat office. The desk and shelves were immaculately organized. So neat in fact that they almost looked sterile. But these walls were completely covered in artwork as well. The overall effect was anything but sterile. It was happy art. He couldn't help but notice a lot of sunrises and rainbows. She followed his gaze and smiled. "We ask our clients to make us pictures. It helps the office feel like home, don't you think?" Before he could answer, she added, "The picture out front that you were studying was made by Josh Hampton. He's a talented artist despite the limitations he has with his hands. Most of our clients are far more enthusiastic than gifted, but we treasure all our pictures." She gestured toward a chair and then, rather than going behind her desk, she took the chair next to it. "I've got the papers you sent over, and everything looks like it's in order." "Great. So you've got a babysitter for us, or can get one?" he asked, somewhat anxiously. Her smile faded and she shook her head. "Yes."